Recently, HTC announced its exit from the Indian market and this was all due to the poor pricing and marketing from the company in India. Blackberry is a company that is trying its best to make a solid comeback in the Android smartphone market but looking at how the company is pricing its devices, it seems like the company won’t be able to compete with the Chinese smartphone makers that have flooded the major smartphone markets with their devices. India is the second largest smartphone market, and it is obvious that every company would like to make an impact in the Indian smartphone market. Companies like Xiaomi, Honor, OnePlus, Oppo, Vivo, etc. are getting huge success by selling their phones in India but this is a trouble for companies like Blackberry, Samsung, LG, etc. Blackberry launched Key2 in India last month at around Rs 43K and at that price, the phone offers Snapdragon 660. This is a ridiculously overpriced smartphone as you can get a Snapdragon 845-powered phone in India at a price as low as Rs 29,999. In fact, the OnePlus 6 starts at around Rs 34,999 in India. Today, Blackberry launched two new phones in India and the story is the same with the pricing. 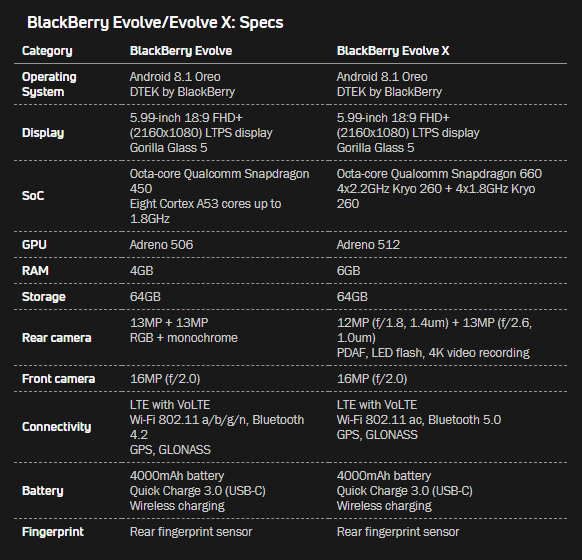 The Blackberry Evolve and Evolve X are two new phones from Blackberry that have launched exclusively in India today. The Evolve and Evolve X have no QWERTY Keyboard like the Key2 and feature 18:9 panels. Both the phones have 5.99-inch IPS LCD panels with FHD+ resolution (2160×1080 pixels). The displays are protected with the Corning Gorilla Glass 5. The build quality is one of the best things about Blackberry devices, and the Blackberry Evolve and Evolve X are no exception. Both the phones have a metal frame and a textured back like the Key2. The Blackberry Evolve X has a ‘Boxy’ design which is not something we see these days with smartphones. The Evolve is also similar in design but is slightly curvy. The fingerprint is present on the rear and is circular on the Evolve X whereas, on the Evolve, it has a square shape. Same is the case with the dual rear camera setup. The camera setup on the Evolve X has a circular design whereas the one on the Evolve has a design similar to the fingerprint scanner. The specifications are something that will surely not impress anyone since the phones are overpriced. The Evolve is powered by the octa-core Qualcomm Snapdragon 450 processor with 4GB RAM and 64GB ROM, whereas the Evolve X is powered by the Snapdragon 660 processor with 6GB RAM and 64GB internal storage. Except for the Processor and RAM, most of the specifications remain the same. Both the phone phones have 4,000mAh batteries with Quick Charge 3.0 support via USB Type-C port. Also, Wireless charging is supported by both the devices as there is a polycarbonate rear panel. Android 8.1 Oreo runs out of the box with DTEK by Blackberry, and the company has promised monthly security patches for both the phones. Both the devices have 16MP front-facing camera with f/2.0 aperture, but the situation is slightly different when we talk about the rear cameras. The Blackberry Evolve has a dual 13MP camera setup on the rear with one sensor being RBG while other being a monochrome. Talking about the dual cameras on Blackberry Evolve X, there is a primary 12MP camera with f/1.8 aperture and 1.4-micron pixel size. The secondary rear camera is a 13MP sensor with f/2.6 aperture and 1.0-micron pixel size. Another difference between the two is that the Evolve has Bluetooth 4.2 while the Evolve X has Bluetooth 5.0. Finally, talking about the pricing, the Blackberry Evolve is priced in India at Rs 24,990 whereas the Evolve X is priced at Rs 34,990. Both the phones are going to be Amazon Exclusive in India. So, what are your opinions on these new phones from Blackberry? Do let us know via the comments section.